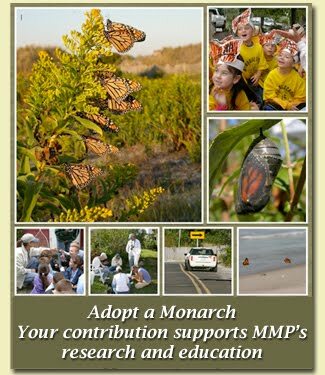 Today -- Monday, Sept. 24 -- we have lots of monarchs around Cape May Point. Most are along the beaches and dunes, though many are also clustered in patches of English Ivy, such as those in vacant lots along Stites Ave. and in various spots near the dune line. Surprisingly there are not many monarchs in the gardens. Don't know what they'll do next or how long this surge will last, but we will keep reporting back to the blog frequently. Thanks to MMP volunteer Paige Cunningham for checking the Point thoroughly this morning and providing this information.